Enjoying the outdoors, from the Northwoods to the tidal flats, wherever life takes me. Observations; news; interviews; hunting, fishing, and camp stories (some true); gun dog stories; product reviews; and a smorgasbord of outdoor pursuits – whatever is in season. On Twitter @sportingafield. 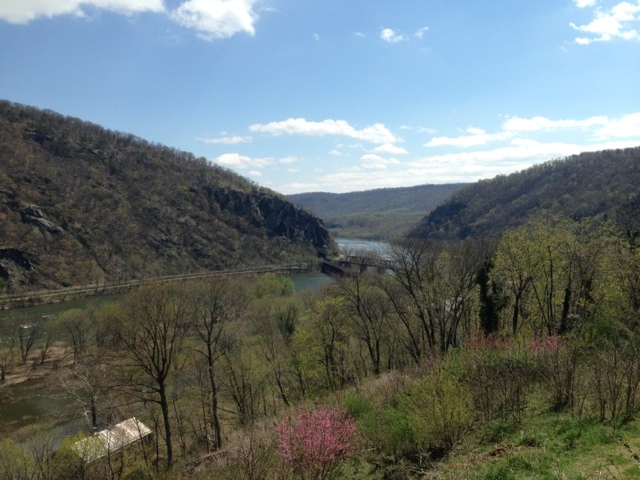 Saturday I decided to take a drive up to Harpers Ferry, West Virginia. It has probably been 15 years since I’ve been up that way. Saturday was forecast to be a nice spring day, high around 70 and lots of sun. Harpers Ferry sits on a point of land at the confluence of the Potomac and the Shenandoah Rivers. It is a place steeped in history. It was visited by George Washington, when he was a young man surveying the area. Thomas Jefferson visited there on his way to Philadelphia. The town is also where Robert E. Lee and Jeb Stuart captured John Brown, after Brown’s failed attempt to break into the armory and use the weapons to launch a slave revolt. Stonewall Jackson captured over 12,000 Union troops there during the Civil War. When I got to town I immediately started hiking up to St. Peter’s Catholic Church, which overlooks the town. 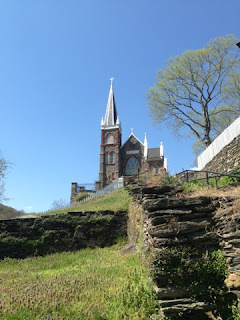 St. Peter’s is right off of a walkway that goes past the church up to a cemetery that is the highest point over the town. 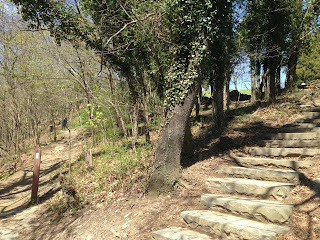 Hiking up to St. Peter’s is where I made my first discovery – the AT goes right by the church. I was already on the AT and didn’t know it. Beautiful. From St. Peter’s, I headed up to the cemetery. It was on my way up to the stone steps to the cemetery that I noticed a wooden post with a white blaze on it. The white blaze signifies the AT. 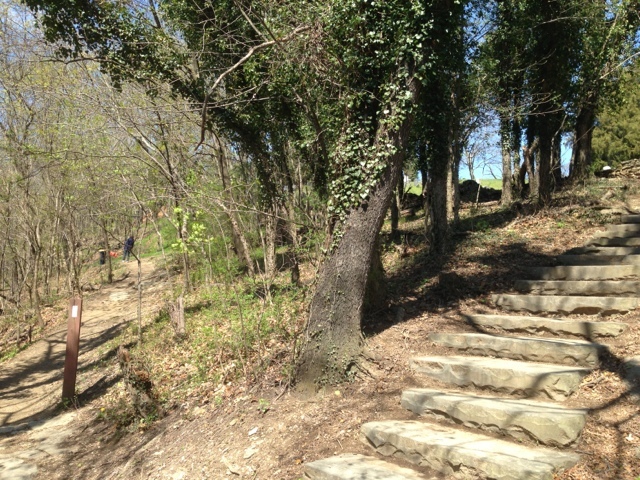 It is a very steep, but short climb from town up the hill to the cemetery. Many of old stones in the cemetery told sad stories of children lost young. While it may have been common during the period, I’m sure it was no less painful. What a beautiful spot to be laid to rest. From the cemetery I walked over to the old Cliff House Hotel. Sadly, the old hotel was fenced off awaiting some unknown fate. The side yard of the hotel still provided a pretty good view looking down the Potomac towards where the Shenandoah enters it. From the hotel I headed up the street to the Appalachian Trail Conservancy headquarters to stop in and pick up a Virginia trail map. It was here that I met “House Broken.” House Broken is what is referred to as a trail name. Many of the “through hikers” take on or are given trail names. A through hiker is someone hiking the entire AT from Georgia to Maine, just over a 2,000 mile walk in the woods. I met House Broken, a through hiker, when I was looking though pictures of this year’s current crop of AT through hikers, all documented at AT headquarters. I inquired whether he had a trail name, to which he replied House Broken. Interesting name, I thought. “So, how’d you come by the name ‘House Broken’?” Turns out it should have been “not” house broken and it followed an evening of heavy drinking on the trail. You can figure out the rest. After visiting the AT center, I hiked down into town and across the Potomac River on a railroad trestle. I then hiked up the river some before it was time to turn around and head back to the traffic of Northern Virginia. 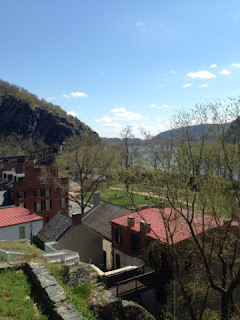 Visiting Harpers Ferry was a great side trip. It got me out of the city. It was wonderful exercise and it was a great way to pass the day. My only regret was that I didn’t bring a fishing pole…they are all back in Vermont. Both the Potomac and Shenandoah rivers hold a ton of Small Mouth Bass and Sunfish. I’ll bring a rod and reel next time. You have to enjoy your days afield where you can find them and I could have done a lot worse than Harpers Ferry. Breaking news, wife attends fly-fishing expo! …I am an innocent victim of literature.